Kristina was an average teen until the monster took hold of her. A visit to her estranged father the summer before her senior year of high school introduces her to the wrong guy, and he gets her hooked on crystal meth. When she's high, her alter-ego, Bree, takes control. She's everything that Kristina is not: promiscuous, rude, assertive—and powerful. After Kristina returns home, she finds herself in a battle for control between what's right and what the monster demands. Ellen Hopkins' first book is one that will blow you away. Kristina is a character that you get to know intimately through the first person narrative in verse form, making her story quite absorbing and very easy to read. Hopkins tells Kristina's tale in a frank, direct way, leaving nothing out—from her lowest moment to how she feels when she is high and everything in between. Bree is an interesting element to the story, because rather than excuse Kristina's behavior, she magnifies that idea that once you become addicted, the most manipulative and desperate part of you is released, intent on finding that next fix. Though this book focuses on some of the toughest issues facing society today, it is important and could be used as a tool to educate teens on the horrors of addiction and how easily things can spin out of control. This engrossing, horrifying, and painfully honest book will make you cringe, but also make you laugh with its surprising moments of humor, oftentimes dark, but mostly it'll have you hoping that against all odds, somehow Kristina will straighten up. 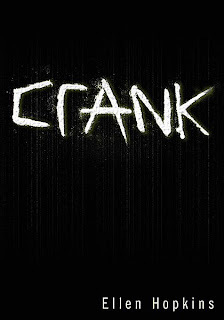 You had better have Glass on hand for when you finish Crank, because you'll most definitely want it. Cover Comments: I think this cover is very befitting of the starkness of this book. It's hard to tell in the picture, but in real life, the title is made out of lines of white powder, which is a subtle but affecting sight. This cover is perfect for the subject matter. Click here for a chance to win Burned, another book by this author, and for the post about the Ellen Hopkins signing.